BitLocker is s a full disk encryption feature included in Windows Vista and Windows 7. It is available only in the Enterprise and Ultimate editions of Windows Vista and Windows 7. Just few minutes ago I had written an article on protecting a pc with a pen drive. Well, you can do the same thing with this software as well. You can set a start up key in a pen drive and then later you need to insert the same pen drive with the startup key into the computer in order to boot the protected operating system. BitLocker has become a saving grace when it comes to increased laptop security. Windows 7 allows you to encrypt removable USB devices and external disks. 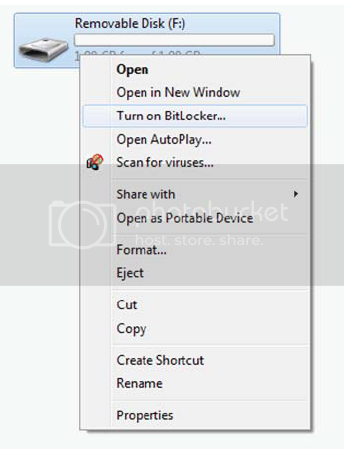 To enable BitLocker, right click the drive in Windows Explorer and select “Turn on BitLocker…” This can also be managed centrally via Group Policy, so IT administrators can require the USB drive be encrypted before files can be written to it.